I purchased a Printrbot Simple a few weeks ago with the hope to make something cool and unique with it. I did use it to print some Christmas ornaments for my family, which was a good way to break it in. I really wanted to model something myself and have it just appear in real life. The 3D printer is a nifty bridge between art and engineering. Specifically, I want to do two things with the device: create something no one has seen before, and experiment with different textures as a medium or a means to augment the qualities of an artistic piece. I think it would be interesting to see someone take a two dimensional piece and apply texture to it, so that the piece takes on different qualities when seen from different angles. That's sort of what I'm doing here, but something I'd like to explore further some day. I imagine that most people exploring the fractal for the first time experience it as a colorful space that you can zoom through in a simulated space ship. I wanted to know what it would look like as a mountainous landscape, and I wanted to see it in real life. 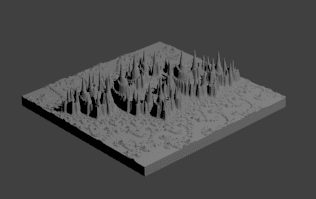 I set out to generate a 3D model of what the fractal looks like, with the Z axis representing "the number of multiplicative iterations before the point on the complex plane assuredly escapes into infinity." This is how the fractals are usually colorized. 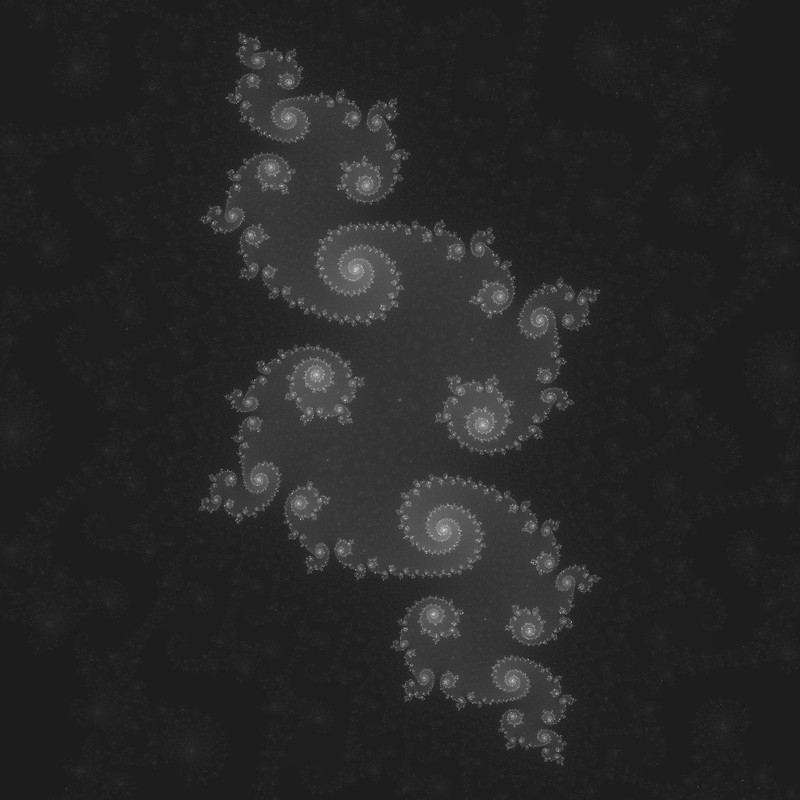 I started with code to visualize the fractal as an image. I used a modified version of this script to generate my "reference image:"
The image intentionally looks like a spooky X ray of some amoeba. It has to be black and white - we're only dealing with three dimensions here! Interesting! A few details: I first used a Gaussian blur on the reference image to make it less "spikey". I also upped the contrast a bit on the reference photo so the outer designs were more visible. Finally I didn't bother orienting my face normals in any direction, so I had to use Blender's Mesh->Normals->Recalculate Outside function. This gave me a solid mesh I could export to an STL. I imported the STL into RepetierHost (which took about 20 minutes) and calculated the G code with Slic3r (which took another 30 minutes). This gave me time to warm up and calibrate my bot.